"Local history is a growth industry. More and more people, with time to spare, are tracing their family trees or working in groups on the history of their neighbourhoods. This means that more and more help is required, and we all know how much we have benefited from an expert word of advice, or direction to an appropriate source. We rely a great deal on what Robert Perks, in this issue, calls 'history from above', but most of us toil below, and it is easy to become discouraged when our research seems to be floundering, especially when we are working alone. Cyril Metcalfe's inquiry into Shelfs past, highlights the problems and the rewards attached to research in a somewhat uncharted region. I hope that this exploratory article will be the first of a series and I am sure that Mr Metcalfe would be interested to hear from any of our members, or any others who wish to make contributions to a 'History of Shelf'." For many people Shelf is an enigma: they are not sure whether it 'belongs' to Bradford or to Halifax. It is situated midway between the two towns and has historical links with both. Nevertheless, it retains even now something of its individuality and sense of identity. If we consider its recent history the story goes back to the period 1805-1829, when township meetings were held in local inns. There were twenty-two meetings at the house of William Lister, or the 'Duke William'. To adopt the Local Government Act of 1858 the first Shelf Local Board was established in 1863, with nine elected members. Its main concerns were roads, water supplies, buildings and nuisances. There are gaps in the Minute Books between 1866 and 1877, and the Board went out of existence in 1894. It was succeeded in the same year by Shelf Urban District Council, a body of nine members chosen by 540 electors. 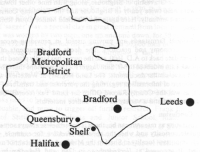 In the following years there were attempts by both Bradford and Halifax to persuade Shelf to amalgamate with them. After friendly meetings between Shelf and Queensbury Council members there came in 1937 the formation of Queensbury and Shelf U.D.C., which continued until 1974, when Shelf became a District within the Metropolitan Borough of Calderdale, and Queensbury became part of Bradford. Its population has never been large and at the last Census in 1981 was just over 4,000. Little research appears to have been done on Shelf and its township, and there are few written records. Even the pages of the Bradford Antiquary and the Transactions of the Halifax Antiquarian Society reveal hardly anything, although John Lister of Shibden Hall presented a paper to the latter society on 'An Excursion to Shelf - the old Manor House of Shelf Hall, High Bentley and Dean House', and the article contains much that is interesting. There are also local history articles published by the Bradford Telegraph & Argus and the Halifax Evening Courier. A delightful article by Harry Hiley-Peel appeared in the Yorkshire Evening Post in 1929, describing the 'Last Days of a Two-man Pit - a little known business in clay mining near Bradford'. In 1879, Rufus Barraclough, a well known Shelf farmer, discovered by accident when sinking a well, a fine seam of 'sagger' clay, a special clay in great demand from local potteries. The clay pit was worked by two men, one up and one down, for 50 years, until it closed in 1929. In this period the pit produced 30,000 tons of valuable clay, and had brought to Rufus, by his 70th birthday, a 'fair bit o'cake'. James Parker of Great Horton, Bradford, wrote books on local history between 1897 and 1904, in which sections on Shelf appeared. He contributed Sketches of Wibsey, Bierley, Coley and Shelf (price three-pence) and Rambles from Hipperholme to Tong, along with photographs and sketches. Although the books need to be treated with care, they contain much that is interesting and valuable, and serve to trigger off further research. Frank Barrett, late Head of Shelf County Infants and Junior School, made excellent contributions to local history. Besides writing a History of Queensbury, he wrote a booklet called Education in Shelf and Local Government in Shelf 1700-1937. This last work, in two parts, consisted of papers read to the Halifax Antiquarian Society. John Whiteley and the Young Communicants of Shelf Parish Church published a useful booklet in 1970, About Shelf - an Anthology, but no one has put together a continuous history of Shelf. Published documentary sources contain much useful information on Shelf, particularly the volumes in the Yorkshire Archaeological Society's Record Series, and Halifax Parish Registers (1538-93). Also of great value is West Yorkshire: An Archaeological Survey to A.D. 1500. This brings together a large number of references to documentary material, published and unpublished, which throws light on the complex manorial history of Shelf. For example, part of it belonged to the Honour of Pontefract and part to the Manor of Wakefield. My own research into Shelf history has brought me into contact with documents and deeds concerning many aspects of the township story. The task in the near future will be to marshal these into date and topic order and then present a balanced account. The Township Books on local government, and their analysis by Frank Barrett, I have already mentioned. The Savile family of Thornhill, Dewsbury, were Lords of the Manor of Shelf for many centuries, and indeed into the present century, and these manorial records will be important. Between 1969 and 1970 the Yorkshire Estate Records of the Saviles were deposited in the Dewsbury Central Library, and I shall be sifting the Shelf references. Some of the Savile records are in the Estate Office in Thornhill, while others are in County Records in Nottingham. Linked with the particular references of Shelf Manor will come more general references in the Wakefield Manor records. For criminal offences Shelf was in the Graveship of Brighouse, along with nine other townships. Courts were held twice yearly in Brighouse and the Township Constables were appointed annually. Here again the Wakfield Manor Court Rolls will be valuable. Individual farmsteads are proving useful in providing records of agricultural economy and practices. The deeds and documents of Carr House Farm date back to A.D. 1600, and the owner has kindly placed these at my disposal. I am indebted to Mr. Sam Jagger for this and hope that other old farms will have similar documents. The Land Registry at Wakefield will be another source of information regarding the purchase and transfer of lands in Shelf, as will the County Record Office for Land Tax records, Quarter Sessions material and a variety of other source materials. Frustrating as research can be, there is nevertheless always something to stimulate curiosity and whet the appetite. Heckden, for example, was a relatively important locality in Shelf in the Middle Ages, but cannot now be identified. It appeared as Heckedenbanc in 1286, and Hekedeyn in 1487, probably deriving from an Old English word meaning 'hatch' or 'gate'. Just how and why the name vanished from local records remains a mystery. Coal mines have been recorded in the township since the 1500s at least, but leases and legal papers of the 18th and 19th centuries reveal how the local ironfounders exploited the reserves of coal and ironstone much more systematically, and also how disputes developed over the mineral rights on the unenclosed sections of Shelf Moor. Paradoxically each discovery opens up new topics, inviting the researcher to follow every ramification of the subject. At the moment I am travelling hopefully, but I look forward to the day when I 'arrive' with a 'History of Shelf, whatever its shortcomings, and however imperfect it may be.